React Casino will then reward you with a bonus (Welcome Bonus is for new players only). The terms and conditions of the bonuses vary between different casinos and might also change over time and between different countries, so it is important to compare the different offers and read the T&C for React Casino before signing up. 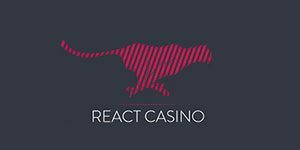 Having opened its virtual doors in 2018, React Casino was developed with both desktop and mobile devices in mind, displaying equally well on both. With its motto being “spinning faster”, React Casino boasts an intuitive website structure and navigation that makes it stand out among the knock-out competition. Available in four languages – English, German, Swedish and Finnish, React Casino is not satisfied with the international language only. The casino is regulated by three bodies – the UK Gambling Commission, Malta Gaming Authority and Curacao, utilises COMODO encryption services and is regularly publicly audited. An Every Matrix NV casino, React Casino prides itself on its all-encompassing portfolio rich in all sorts of games coming from a powerful army of well-known online software providers. In its orders, you will find games manufactured in studios of Microgaming, NetEnt, IGT and Play’n GO, as well as Betsoft, Scientific Games and Tom Horn Gaming. Slots are hands down the hottest category on the site. Helping you choose the next game to play on, React Casino singles out a selection of the most popular games and also allows you to select your own favourites. The venue is home to a massive amount of popular and new titles, classics and hipster games alike, so you can enjoy Immortal Romance, Big Bad Wolf, Jurassic Park and Northern Sky, as well as Phoenix Sun and Terminator 2, for example. While at it, make sure to pay a visit to the opulent jackpot collection and take some nifty winnings home! Expanding the quality of its offering, React Casino possesses a grand chest of table games that include single and multi deck Blackjack, Vegas Strip Blackjack Gold, Premier Roulette, European Roulette, Oasis Poker, Caribbean Stud Poker and dozens more. Some online casinos focus on one or two departments and excel at that, and some online gambling venues like to give their clients the best of all worlds. In addition to mesmerising slot and table game collections, React Casino has enriched its portfolio with various other games for you to choose from. You can play on a wide diapason of video poker titles like All Aces, Joker Poker, Jacks or Better and Deuces Wild, for instance, all available in single- and multi-hand modes. If they don’t fill up your cup, you can opt for the ample range of scratch card games, Keno, Virtual Racebook, and other lottery classics like Bingo Bonanza and Electro Bingo. Owning 31 Live Dealer games supplied by a range of award-winning live games suppliers such as Evolution Gaming, Ezugi, Portomaso and Vivo, React Casino sets itself among the best online live casinos. Attractive and talkative croupiers will deal for you around the clock, and with the supreme service and professionalism comes a round of humour which you can experience chatting with your designated dealer live. The live games you can play at React Casino include classics like Live Baccarat, Live Blackjack and Live Roulette, but also exotic titles like Live Baccarat Macao, Live Baccarat Squeeze, Fashion Puntobanco and Live Baccarat Fantasy, to name a few. If any online casino makes sure that its clients feel at home, then it is certainly React Casino. Welcoming customers from all over the world, this online gambling venue hosts a line of over 20 international currencies that include Mexican pesos, Peruvian nuevos soles, Croatian kunas, South Korean won, Romanian lei and Czech Republic korunas. The site also deals with requests pretty quickly and easily, taking only about 24 hours for ewallet requests to process, and up to 3 days for requests made using cards or bank transfers. The pending time for all totals 24 hours as well, which is decent. Ewallets supported at React Casino include Neteller, Skrill, Trustly and others, but React Casino states on the website that certain methods might not be available, depending on which country you are depositing/withdrawing from. Credit and debit cards accepted at this online casino are Visa, MasterCard and Maestro, with MasterCard having certain withdrawal restrictions in comparison with others. While the venue does not state the upper withdrawal limit, if you are withdrawing over 10,000, you might need to verify your identity for safety purposes. There is a wide range of options when it comes to contacting React Casino’s customer service team. Live Chat is available from the bottom left corner of the homepage. Simply provide your name and email address and you can chat away. Type in your enquiry and let the chatting begin! You can talk to a professional agent anytime around the clock and get instant help anytime. React Casino might be new in the business, but certainly knows what to focus on when it comes to pleasing its customers. Some players prefer email correspondence, so the address for all written enquiries is [email protected] It is also open 24/7, so don’t be a stranger and drop them a line anytime!